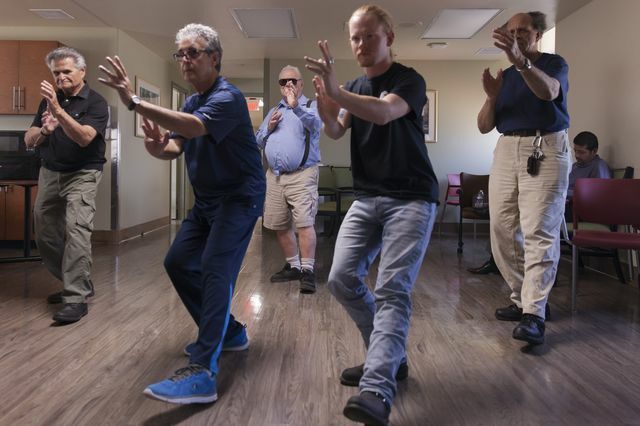 UCLA Recreation instructor Peter Asco, second from the left, leads veterans in a tai chi/qi gong class. Christophe Carter, a 73-year-old Vietnam veteran, was once homeless and struggling with a sleep disorder and obesity, when a visit to the U.S. Department of Veterans Affairs West Los Angeles campus began to turn things around. The V.A. connected the Army veteran with housing, and a doctor recommended exercise. Carter hated “gyms and barbells,” so he looked for alternatives at the V.A. “The only class they offered, besides barbells and machines, was this mysterious martial arts class — tai chi,” he recalled. 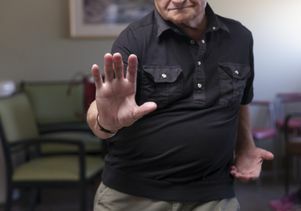 Tai chi, said one veteran, reconnected him to activities he enjoyed in the past. These mental and physical improvements are the reason behind a series of therapeutic recreation classes offered recently by UCLA to veterans at the V.A.’s West L.A. campus. In a pilot project that just ended, but could return on a permanent basis, UCLA Recreation instructors taught art therapy, creative writing, and a combination of tai chi and qi gong. 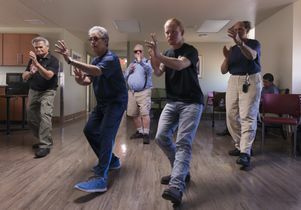 The tai chi and qi gong class has a long history, said tai chi master and UCLA instructor Peter Asco, who was excited to return to the V.A. campus, where he has taught before. Asco’s returning students said the class has improved their flexibility and balance, as expected, but also helped some of them lower their blood pressure, control their diabetes and eliminate the need for costly and invasive surgeries. They also experienced better mental health, including an increased sense of serenity that lasts throughout the day. Asco has seen dramatic improvements in his students over the years. 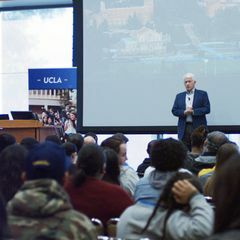 The creative writing class has proven to be the most popular of the three UCLA classes, and, because this is Los Angeles, the students range from novice scribblers to members of the Screenwriters Guild of America. UCLA writing instructor Robert Morgan Fisher, whose father was a career Naval officer, calls his students the UCLA “Wordcommandos,” and they call him “Gunny,” Marine Corps slang for a drill instructor. He provides instruction, suggests writing prompts, and brings in books and literary magazines for inspiration, but encourages his students to attempt any kind of writing. His goal is to help them successfully submit their work for publication. Students in the art therapy class have tackled watercolors, crayons, collages and more. The creative outlet lets them express emotions they may not be able to put into words, said UCLA art therapy instructor and artist Buena Johnson. She supports them in expressing joy or pain, but her favorite moments have been when the students tell her how good the class makes them feel. That realization made her restructure the class to make it more flexible, so she’s sure they all have a chance to get to the V.A. dining halls to get a decent meal. But the vets in the classes describe the lessons as feeding a different need. Over and over, the students explained how the UCLA classes calmed their anxieties and gave them a place to focus. That calm and focus, they said, have spread from the classes into other parts of their lives, making everything a little brighter. Veterans take a class offered by UCLA Recreation at the V.A. West Los Angeles campus. Angelos, a veteran, does a tai chi move during a class offered by a UCLA Recreation instructor.